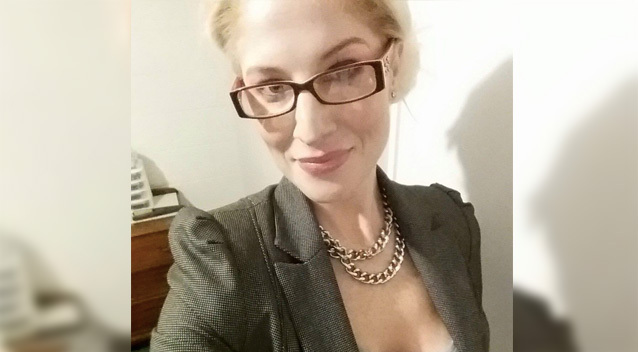 A mystery woman, who claims to be a long-time supporter and girlfriend of Gable Tostee, has labeled Warriena Wright as a “phycho (sic) drunk” while unleashing on a journalist online. 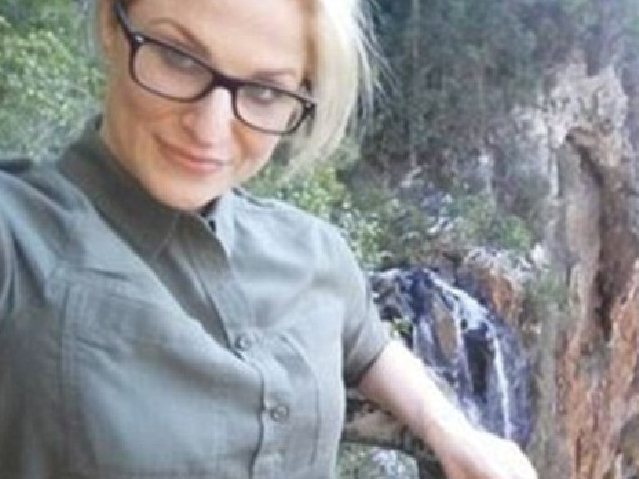 New Zealander Lizzi Evans had taken to Facebook multiple times in defence of Mr Tostee, during his Supreme Court trial over the murder of Ms Wright. Mr Tostee was found not guilty of murder or manslaughter after Ms Wright fell from his Gold Coast apartment balcony in 2014. The pair had met on Tinder. News.com.au reports Ms Evans has claimed she was Mr Tostee’s long-term girlfriend. 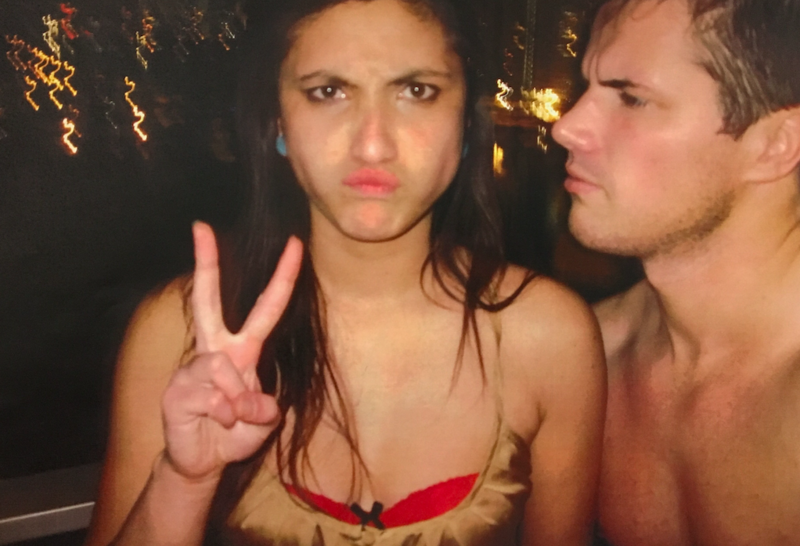 Ms Evans reportedly wrote to a forum group on Facebook that she was Gable Tostee's girlfriend. Photo: Facebook. It’s reported the pair had been seeing each other since at least April 2016. Ms Evans reportedly showed support for Mr Tostee during the final days of the murder trial. News.com.au claims she was seen sitting beside his parents Gray and Helene as the jury delivered the not guilty verdict last Thursday. After the verdict, Ms Evans unleashed a Facebook tirade on a New Zealand journalist, defending Mr Tostee. In her post she called the journalist's opinion piece on Mr Tostee “trashy” and labeled Warriena Wright a “self-confessed phycho drunk”(sic). 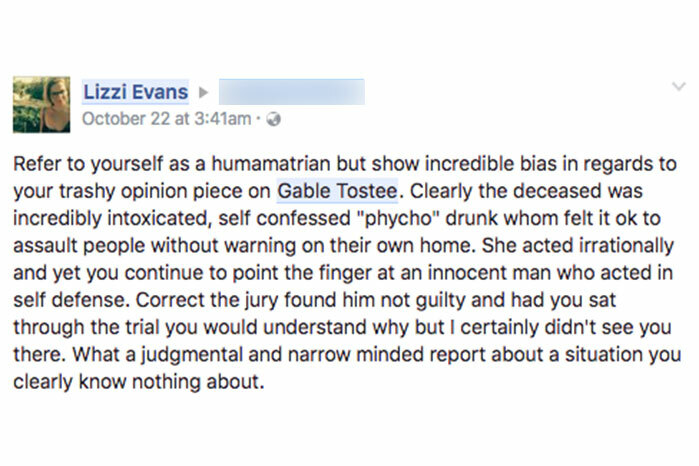 Ms Evans took to Facebook to defend Mr Tostee after the not-guilty verdict. Photo: Facebook. “Clearly the deceased was incredibly intoxicated, self confessed "phycho" drunk whom felt it ok to assault people without warning on their own home,” Ms Evans wrote. “She acted irrationally and yet you continue to point the finger at an innocent man who acted in self defense. 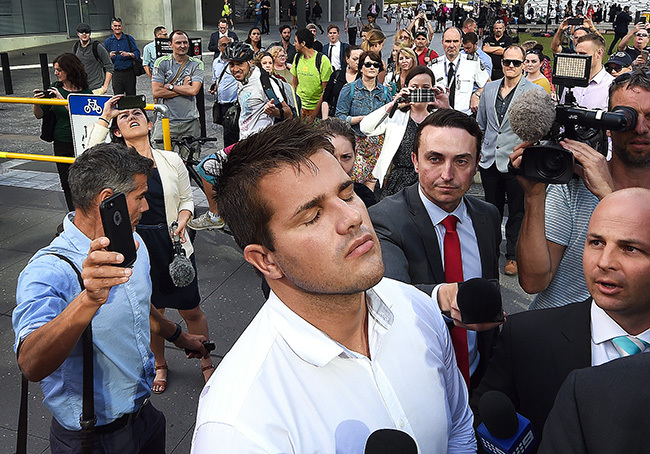 Gable Tostee spent the first weekend after his murder trial acquittal reading news stories about himself on the internet, a video posted to Snapchat has revealed. The video was filmed by Lizzi Evans, obtained by The Daily Mail, and was posted on Ms Evans Snapchat late on Saturday night, showing 30-year-old Tostee laying down and scrolling through his phone. “All Gable ever does is just read about himself,” she can be heard saying, suggesting he is looking up stories relating to his trial. 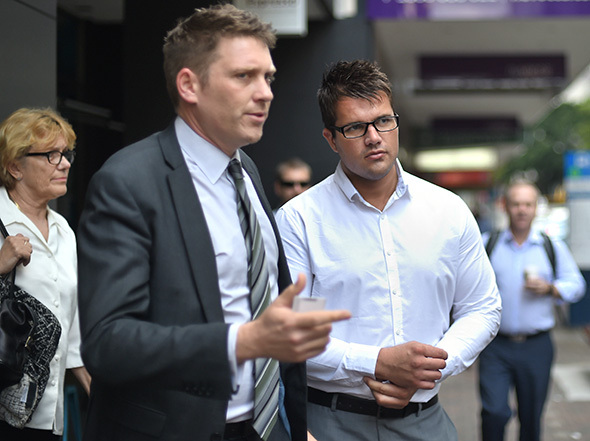 She walked out of court next to Tostee on the day of the verdict, and took to Facebook in the days after his acquittal to slam a New Zealand reporter over a column that she found ‘biased’. A lengthy explanation written by Tostee about the night of Ms Wright’s death was uncovered on Monday, detailing his version of events. The 2300-word post was posted on a bodybuilding.com forum in December 2014, four months after the tragedy. He discusees why he put Ms Wright on the balcony, what caused the ‘choking’ noises, why he recorded the event and why he bought pizza after the incident. “At first we got along great but as the night continued her behaviour became strange and she became increasingly aggressive,” he wrote. 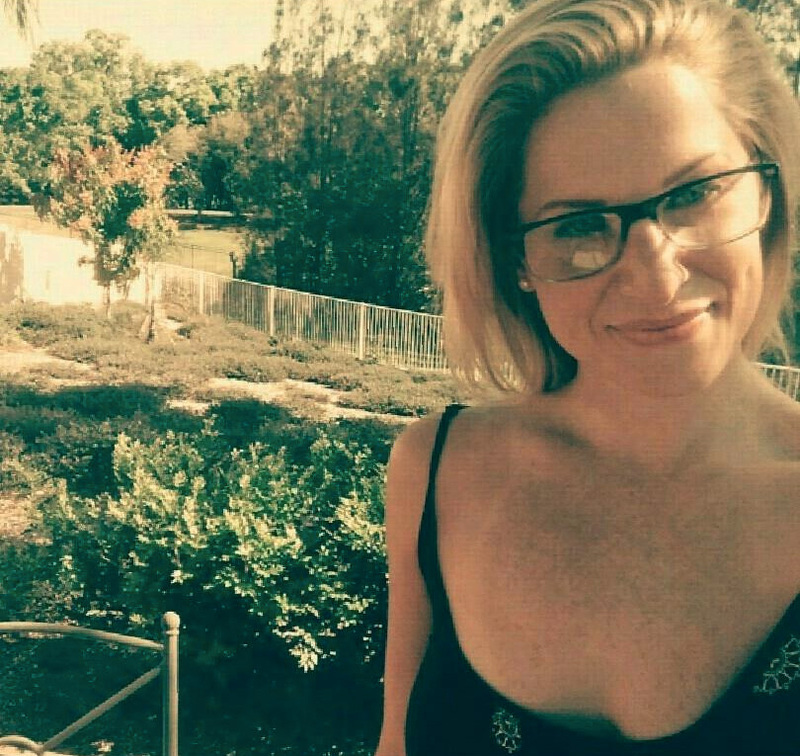 “She kept hitting me, taunting me, throwing my stuff around and trashing my apartment." He claims he tried for "a couple of hours" to calm Ms Wright down after her behaviour "became too overbearing". “If I wanted to choke her out then it probably wouldn’t have been hard, but I did not do that as I did not want to hurt her." He said he forced her on to the balcony in an attempt to “de-escalate” the situation and separate the pair. “After shutting the door I turned my back and retreated, and literally about 10 seconds later when I turned around and looked through the glass I only briefly for a fraction of a second saw Warriena on the other side of the railing before she disappeared out of view. “She never tried to get back in, bang on the door or even cry out to me or anyone else. She climbed over without any warning. “I was too far away to react. At the time I couldn’t tell if she had fallen or climbed down to another floor. All I knew was that she was no longer there ... I was in disbelief." Tostee said he often recorded encounters with women for his own protection “in case something happened”. He said in some cases the recordings have been “invaluable”.